"A toast to the duke of Claymore and his bride!" At this wedding, no one cheered and no one raised a goblet. At this wedding, everyone was watching everyone else, and everyone was tense. The bride's family was tense. The groom's family was tense. The guests and the servants and the hounds in the hall were tense. Even the first earl of Merrick, whose portrait hung above the fireplace, looked tense. "A toast to the duke of Claymore and his bride," the groom's brother pronounced again, his voice like a thunderclap in the unnatural, tomblike silence of the crowded hall. "May they enjoy a long and fruitful life together." Normally, that ancient toast brings about a predictable reaction: The groom always smiles proudly because he's convinced he's accomplished something quite wonderful. The bride smiles because she's been able to convince him of it. The guests smile because, amongst the nobility, a marriage connotes the linking of two important families and two large fortunes -- which in itself is cause for great celebration and abnormal gaiety. Having made the toast, the groom's brother raised his goblet and smiled grimly at the groom. The groom's friends raised their goblets and smiled fixedly at the bride's family. The bride's family raised their goblets and smiled frigidly at each other. The groom, who alone seemed to be immune to the hostility in the hall, raised his goblet and smiled calmly at his bride, but the smile did not reach his eyes. In truth, Jennifer was so frantic she scarcely knew anyone was there. At the moment, every fiber of her being was concentrating on a last-minute, desperate appeal to God, Who out of lack of attention or lack of interest, had let her come to this sorry pass. "Lord," she cried silently, swallowing, the lump of terror swelling in her throat, "if You're going to do something to stop this marriage, You're going to have to do it quickly, or in five minutes 'twill be too late! Surely, I deserve something better than this forced marriage to a man who stole my virginity! I didn't just hand it over to him, You know!" Realizing the folly of reprimanding the Almighty, she hastily switched to pleading: "Haven't I always tried to serve You well," she whispered silently. "Haven't I always obeyed You?" "NOT ALWAYS, JENNIFER," God's voice thundered in her mind. "Nearly always," Jennifer amended frantically. "I attended mass every day, except when I was ill, which was seldom, and I said my prayers every morning and every evening. Nearly every evening," she amended hastily before her conscience could contradict her again, "except when I fell asleep before I was finished. And I tried, I truly tried to be all that the good sisters at the abbey wanted me to be. You know now hard I've tried! Lord," she finished desperately, "if you'll just help me escape from this, I'll never be willful or impulsive again." "THAT I DO NOT BELIEVE, JENNIFER," God boomed dubiously. "Nay, I swear it," she earnestly replied, trying to strike a bargain. "I'll do anything You want, I'll go straight back to the abbey and devote my life to prayer and -- "
"The marriage contracts have been duly signed. Bring in the priest," Lord Balfour commanded, and Jennifer's breath came in wild, panicked gasps, all thoughts of potential sacrifices fleeing from her mind. "God," she silently pleaded, "why are You doing this to me? You aren't going to let this happen to me, are You?" The crowd parted automatically to admit the priest, and Jennifer felt as if her life were ending. Her groom stepped into position beside her, and Jennifer jerked an inch away, her stomach churning with resentment and humiliation at having to endure his nearness. If only she had known how one heedless act could end in disaster and disgrace. If only she hadn't been so impulsive and reckless! When she was fifteen, those were the things that had led her to try to avenge herself against her sly, spiteful stepbrother in what had seemed a right and honorable way -- which was to secretly don Merrick armor and then ride against him, fairly, in the lists. That magnificent folly had gained her a sound thrashing from her father right there on the field of honor -- and only a tiny bit of satisfaction from having knocked her wicked stepbrother clean off his horse! But it was too late for prayers and promises now. Her fate had been sealed from the moment, seven weeks ago, when she'd been dumped at the feet of the arrogant beast beside her, trussed up like a feastday partridge. Jennifer swallowed. No, before that -- she'd veered down this path to disaster earlier that same day when she'd refused to heed the warnings that the Black Wolf's armies were nearby. But why should she have believed it, Jennifer cried in her own defense. "The Wolf is marching on us!" had been a terrified call of doom issued almost weekly throughout the last five years. But on that day, seven weeks ago, it had been woefully true. At the time, it had seemed an unusually pretty day, the sky a cheerful blue, the air balmy. The sun had been shining down upon the abbey, bathing its Gothic spires and graceful arches in bright golden light, beaming benignly upon the sleepy little village of Belkirk, which boasted the abbey, two shops, thirty-four cottages, and a communal stone well in the center of it, where villagers gathered on Sunday afternoons, as they were doing then. On a distant hill, a shepherd looked after his flock, while in a clearing not far from the well, Jennifer had been playing hoodman -- blind with the orphans whom the abbess had entrusted to her care. "Where are you, Tom MacGivern?" she called out, groping about with outstretched arms, pretending she couldn't locate the giggling nine-year-old boy, who her ears told her was only a foot away on her right. Grinning beneath the concealing hood, she assumed the pose of a classic "monster" by holding her arms high in front of her, her fingers spread like claws, and began to stomp about, calling in a deep, ominous voice, "You can't escape me, Tom MacGivern." "Ha!" he shouted from her right. "You'll no' find me, hoodman!" "Yes, I will!" Jenny threatened, then deliberately turned to her left, which caused gales of laughter to erupt from the children who were hiding behind trees and crouching beside bushes. "I've got you!" Jenny shouted triumphantly a few minutes later as she swooped down upon a fleeing, giggling child, catching a small wrist in her hand. Breathless and laughing, Jenny yanked off her hood to see whom she'd captured, mindless of the red gold hair tumbling down over her shoulders and arms. "You got Mary!" the children crowed delightedly. "Mary's the hoodman now!" The little five-year-old girl looked up at Jenny, her hazel eyes wide and apprehensive, her thin body shivering with fear. "Please," she whispered, clinging to Jenny's leg, "I -- I not want to wear th' hood -- 'Twill be dark inside it. Do I got to wear it?" Smiling reassuringly, Jenny tenderly smoothed Mary's hair off her thin face. "Not if you don't want." "I'm afeert of the dark," Mary confided unnecessarily, her narrow shoulders drooping with shame. Sweeping her up into her arms, Jenny hugged her tightly. "Everybody is afraid of something," she said and teasingly added, "Why, I'm afraid of -- of frogs!" The dishonest admission made the little girl giggle. "Frogs!" she repeated, "I likes frogs! They don't sceer me 'tall." "There, you see -- " Jenny said as she lowered her to the ground. "You're very brave. Braver than I!" "Lady Jenny is afeart of silly ol' frogs," Mary told the group of children as they ran forward. "No she isn -- " young Tom began, quick to rise to the defense of the beautiful Lady Jenny who, despite her lofty rank, was always up to anything -- including hitching up her skirts and wading in the pond to help him catch a fat bullfrog -- or climbing up a tree, quick as a cat, to rescue little Will who was afraid to come down. Tom silenced at Jenny' s pleading look and argued no more about her alleged fear of frogs. "I'll wear the hood," he volunteered, gazing adoringly at the seventeen-year-old girl who wore the somber gown of a novice nun, but who was not one, and who, moreover, certainly didn't act like one. Why, last Sunday during the priest's long sermon, Lady Jenny's head had nodded forward, and only Tom's loud, false coughing in the bench behind her had awakened her in time for her to escape detection by the sharp-eyed abbess. "'Tis Tom's turn to wear the hood," Jenny agreed promptly, handing Tom the hood. Smiling, she watched the children scamper off to their favorite hiding places, then she picked up the wimple and short woolen veil she'd taken off in order to be the hoodman. Intending to go over to the communal well where the villagers were eagerly questioning some clansmen passing through Belkirk on their way to their homes from the war against the English in Cornwall, she lifted the wimple, intending to put it on. "Lady Jennifer!" One of the village men called suddenly, "Come quick -- there's news of the laird." The veil and wimple forgotten in her hand, Jenny broke into a run, and the children, sensing the excitement, stopped their game and raced along at her heels. "What news?" Jenny asked breathlessly, her gaze searching the stolid fares of the groups of clansmen. One of them stepped forward, respectfully removing his helm and cradling it in the crook of his arm. "Be you the daughter of the laird of Merrick?" At the mention of the name Merrick, two of the men at the well suddenly stopped in the act of pulling up a bucket of water and exchanged startled, malevolent glances before they quickly ducked their heads again, keeping their faces in shadow. "Yes," Jenny said eagerly. "You have news of my father?" "Aye, m'lady. He's comin' this way, not far behind us, wit a big band o' men." Thank God," Jenny breathed. "How goes the battle at Cornwall?" she asked after a moment, ready now to forget her personal concerns and devote her worry to the battle the Scots were waging at Cornwall in support of King James and Edward V's claim to the English throne. His face answered Jenny's question even before he said, "'Twas all but over when we left. In Cork and Taunton it looked like we might win, and the same was true in Cornwall, until the devil hisself came to take command 'o Henry's army." "The devil?" Jenny repeated blankly. Hatred contorted the man's face and he spat on the ground. "Aye, the devil -- the Black Wolf hisself, may he roast in hell from whence he was spawned." Two of the peasant women crossed themselves as if to ward off evil at the mention of the Black Wolf, Scotland's most hated, and most feared, enemy, but the man's next words made them gape in fear: "The Wolf is comin' back to Scotland. Henry's sendin' him here with a fresh army to crush us for supportin' King Edward. 'Twill be murder and bloodshed like the last time he came, only worst, you mark me. The clans are making haste to come home and get ready for the battles. I'm thinkin' the Wolf will attack Merrick first, before any o' the rest of us, for 'twas your clan that took the most English lives at Cornwall." Had Jenny been watching, she might have caught a brief glimpse of them doubling back through the woods that ran beside the road right behind her. But at the time, she was occupied with the terrified pandemonium that had broken out among the citizens; of Belkirk, which happened to lie directly in the path between England and Merrick keep. "The Wolf is coming!" one of the women cried, clutching her babe protectively to her breast. "God have pity on us." "'Tis Merrick he'll strike at," a man shouted, his voice rising in fear. "'Tis the laird of Merrick he'll want in his jaws, but 'tis; Belkirk he'll devour on the way. " Suddenly the air was filled with gruesome predictions of five and death and slaughter, and the children crowded around Jenny, clinging to her in mute horror. To the Scots, be they wealthy noble or lowly villager, the Black Wolf was more evil than the devil himself, and more dangerous, for the devil was a spirit, while the Wolf was flesh and blood -- the living Lord of Evil -- a monstrous being who threatened their existence, right here on earth. He was the malevolent specter that the Scots used to terrify their offspring into behaving. "The Wolf will get you," was the warning issued to keep children from straying into the woods or leaving their beds at night, or from disobeying their elders. Impatient with such hysteria over what was, to her, more myth than man, Jenny raised her voice in order to be heard over the din. "'Tis more likely," she called, putting her arms around the terrified children who'd crowded against her at the first mention of the Wolf's name, "that he'll go back to his heathen king so that he can lick the wounds we gave him at Cornwall while he tells great lies to exaggerate his victory. And if he does not do that, he'll choose a weaker keep than Merrick for his attack -- one he's a chance of breeching." Her words and her tone of amused disdain brought startled gazes flying to her face, but it wasn't merely false bravado that had made Jenny speak so: She was a Merrick, and a Merrick never admitted to fear of any man. She had heard that hundreds of times when her father spoke to her stepbrothers, and she had adopted his creed for her own. Furthermore, the villagers were frightening the children, which she refused to let continue. Mary tugged at Jenny's skirts to get her attention, and in a shrill little voice, she asked, "Isn't you afeert of the Black Wolf, Lady Jenny?" "Of course not!" Jenny said with a bright, reassuring smile. "They say," young Tom interjected in an awed voice, "the Wolf is as tall as a tree!" "A tree!" Jenny chuckled, trying to make a huge joke of the Wolf and all the lore surrounding him. "If he is, 'twould be a sight worth seeing when he tries, to mount his horse! Why, 'twould take four squires to hoist him up there!" "I heert -- " said young Will with an eloquent shudder, "he tears down walls with his bare hands and drinks blood!" "Yuk!" said Jenny with twinkling eyes. "Then 'tis only indigestion which makes him so mean. If he comes to Belkirk, we'll offer him some good Scottish ale instead." "My pa said," put in another child, "he rides with a giant beside him, a Go-liath called Arik who carries a war axe and chops up children..."
"I heert -- " another child interrupted ominously. Jenny cut in lightly, "Let me tell you what I have heard." With a bright smile, she began to shepherd them toward the abbey, which was out of sight just beyond a bend down the road. "I heard," she improvised gaily, "that he's so very old that he has to squint to see, just like this -- "
As they walked along, Jenny kept up the same light-hearted teasing comments, and the children fell in with the game, adding their own suggestions to make the Wolf seem absurd. But despite the laughter and seeming gaiety of the moment, the sky had suddenly darkened as a bank of heavy clouds rolled in, and the air was turning bitingly cold, whipping Jenny's cloak about her, as if nature herself brooded at the mention of such evil. Jenny was about to make another joke at the Wolf's expense, but she broke off abruptly as a group of mounted clansmen rounded the bend from the abbey, coming toward her down the road. A beautiful girl, clad as Jenny was in the somber gray gown, white wimple, and short gray veil of a novice nun, was mounted in front of the leader, sitting demurely sideways in his saddle, her timid smile confirming what Jenny already knew. With a silent cry of joy, Jenny started to dash forward, then checked the unladylike impulse and made herself stay where she was. Her eyes clung to her father, then drifted briefly over her clansmen, who were staring past her with the same grim disapproval they'd shown her for years -- ever since her stepbrother had successfully circulated his horrible tale. Her father, who'd obviously stopped at the abbey where Brenna, Jenny's stepsister, was also staying, swung down from his horse, then he turned to lift Brenna down. Jenny chafed at the delay, but his scrupulous attention to courtesy and dignity was so typical of the great man that a wry smile touched her lips. Finally, he turned fully toward her, opening his arms wide. Jenny hurtled into his embrace, hugging him fiercely, babbling in her excitement: "Father, I've missed you so! 'Tis nearly two years since I've seen you! Are you well? You look well. You've scarce changed in all this time!" Gently disentangling her arms from about his neck, Lord Merrick set his daughter slightly away from him while his gaze drifted over her tousled hair, rosy cheeks, and badly rumpled gown. Jenny squirmed inwardly beneath his prolonged scrutiny, praying that he approved of what he saw and that, since he'd obviously stopped at the abbey already, the abbess's report had been pleasing to him. Two years ago, her behavior had gotten her sent to the abbey; a year ago, Brenna had been sent down here for safety's sake while the laird was at war. Under the abbess's firm guidance, Jenny had come to appreciate her strengths, and to try to overcome her faults. But as her father inspected her from head to toe, she couldn't help wondering if he saw the young lady she was now or the unruly girl she'd been two years ago. His blue eyes finally returned to her face and there was a smile in them. "Ye've become a woman, Jennifer." Jenny's heart soared; coming from her taciturn father, such a comment constituted high praise. "I've changed in other ways too, Father," she promised, her eyes shining. "I've changed a great deal." "Not that much, my girl." Raising his shaggy white brows, he looked pointedly at the short veil and wimple hanging forgotten from her fingertips. "Oh!" Jenny said, laughing and anxious to explain. "I was playing hoodman-blind...er...with the children, and it wouldn't fit beneath the hood. Have you seen the abbess? What did Mother Ambrose tell you?" Laughter sparked in his somber eyes. "She told,me," he replied dryly, "that ye've a habit of sitting on yon hill and gazing off into the air, dreaming, which sounds familiar, lassie. And she told me ye've a tendency to nod off in the midst of mass, should the priest sermonize longer than you think seemly, which iliar." Jenny's heart sank at this seeming betrayal from the abbess whom she so admired. In a sense, Mother Ambrose was laird of her own grand demesne, controlling revenues from the farmlands and livestock that belonged to the splendid abbey, presiding at table whenever there were visitors, and dealing with all other matters that involved the laymen who worked on the abbey grounds as well as the nuns who lived cloistered within its soaring walls. Brenna was terrified of the stern woman, but Jenny loved her, and so the abbess's apparent betrayal cut deeply. Her father's next words banished her disappointment. "Mother Ambrose also told me," he admitted with gruff pride, "that you've a head on your shoulders befitting an abbess herself. She said you're a Merrick through and through, with courage enough to be laird of yer own clan. But you'll no' be that," he warned, dashing Jenny's fondest dream. With an effort, Jenny kept the smile pinned to her face, refusing to feel the hurt of being deprived of that right -- a right that had been promised to her until her father married Brenna's widowed mother and acquired three stepsons in the bargain. Alexander, the eldest of the three brothers, would assume the position that had been promised to her. That, in itself, wouldn't have been nearly so hard to bear if Alexander had been nice, or even fair-minded, but he was a treacherous, scheming liar, and Jenny knew it, even if her father and her clan did not. Within a year after coming to live at Merrick keep, he'd begun carrying tales about her, tales so slanderous and ghastly, but so cleverly contrived, that, over a period of years, he'd turned her whole clan against her. That loss of her clan's affection still hurt unbearably. Even now, when they were looking through her as if she didn't exist for them, Jenny had to stop herself from pleading with them to forgive her for things she had not done. William, the middle brother, was like Brenna, sweet and as timid as can be -- while Malcolm, the youngest, was as evil and as sneaky as Alexander. "The abbess also said," her father continued, "that you're kind and gentle, but you've spirit, too..."
"Aye." Jenny would normally have rejoiced in that answer, but she was watching her father's face, and it was becoming more grim and tense than she had ever seen it. Even his voice was strained as he said, "'Tis well you've given up your heathenish ways and that you're all the things you've become, Jennifer." He paused as if unable or unwilling to continue, and Jenny prodded gently, "Why is that, Father?" "Because," he said, drawing a long, harsh breath, "the future of the clan will depend on your answer to my next question." His words trumpeted in her mind like blasts from a clarion, leaving Jenny dazed with excitement and joy: "The future of the clan depends on you..." She was so happy, she could scarcely trust her ears. It was as if she were up on the hill overlooking the abbey, dreaming her favorite daydream -- the one where her father always came to her and said, "Jennifer, the future of the clan depends on you. Not your stepbrothers. You " It was the chance she'd been dreaming of to prove her mettle to her clansmen and to win back their affection. In that daydream, she was always called upon to perform some incredible feat of daring, some brave and dangerous deed, like scaling the wall of the Black Wolf's castle and capturing him single-handedly. But no matter how daunting the task, she never questioned it, nor hesitated a second to accept the challenge. She searched her father's face. "What would you have me do?" she asked eagerly. "Tell me, and I will! I'll do any --"
"Will you marry Edric MacPherson?" "Whaaat?" gasped the horrified heroine of Jenny's daydream. Edric MacPherson was older than her father, a wizened, frightening man who'd looked at her in a way that made her skin crawl ever since she'd begun to change from girl to maiden. "Will you, or will you no'?" Jenny's delicate auburn brows snapped together. "Why?" asked the heroine who never questioned. A strange, haunted look darkened his face. "We took a beating at Cornwall, lass -- we lost half our men. Alexander was killed in battle. He died like a Merrick," he added with grim pride, "fighting to the end." "I'm glad for your sake, Papa," she said, unable to feel more than a brief pang of sorrow for the stepbrother who'd made her life into a hell. Now, as she often had in the past, she wished there were something she could do to make him proud of her. "I know you loved him as if he were your own son." Accepting her sympathy with a brief nod, he returned to the discussion at hand: "There were many amongst the clans who were opposed to going to Cornwall to fight for King James's cause, but the clans followed me anyway. 'Tis no secret to the English that 'twas my influence which brought the clans to Cornwall, and now the English king wants vengeance. He's sendin' the Wolf to Scotland to attack Merrick keep." Ragged pain edged his deep voice as he admitted, "'We'll no' be able to withstand a siege now, not unless the MacPherson clan comes to support us in our fight. The MacPherson has enough influence with a dozen other clans to force them to join us as well." Her father's harsh voice snapped her out of her daze. "Jennifer' Do you ken what I've been saying? MacPherson has promised to join in our fight, but only if you'll have him for husband." Through her mother, Jenny was a countess and heiress to a rich estate which marched with MacPherson's. "He wants my lands?" she said almost hopefully, remembering the awful way Edric MacPherson's eyes had wandered down her body when he'd stopped at the abbey a year ago to pay a "social call" upon her. "Couldn't we just give them to him in return for his support?" she volunteered desperately, ready -- willing -- to sacrifice a splendid demesne without hesitation, for the good of her people. "He'd not agree to that!" her father said angrily. "There's honor in fighting for kin, but he could no' send his people into a fight that's no' their own, and then take your lands in payment to him." "But, surely, if he wants my lands badly enough, there's some way -- "
"He wants you. He sent word to me in Cornwall." His gaze drifted over Jenny's face, registering the startling changes that had altered her face from its thin, freckled, girlish plainness into a face of almost exotic beauty. "Ye've your mother's look about ye now, lass, and it's whetted the appetites of an old man. I'd no' ask this of you if there was any other way." Gruffly, he reminded her, "You used to plead wi' me to name you laird. Ye said there was naught you wouldna' do fer yer clan..."
Jenny's stomach twisted into sick knots at the thought of committing her body, her entire life, into the hands of a man she instinctively recoiled from, but she lifted her head and bravely met her father's gaze. "Aye, father," she said quietly. "Shall I come with you now?" The look of pride and relief on his face almost made the sacrifice worthwhile. He shook his head. "'Tis best you stay here with Brenna. We've no horses to spare and we're anxious to reach Merrick and begin preparations for battle. I'll send word to the MacPherson that the marriage is agreed upon, and then send someone here to fetch you to him." When he turned to remount his horse, Jenny gave into the temptation she'd been fighting all along; Instead of standing aside, she moved into the rows of mounted clansmen who had once been her friends and playmates. Hoping that some of them had perhaps heard her agree to marry the MacPherson and that this might neutralize their contempt of her, she paused beside the horse of a ruddy, red-headed man. "Good day to you, Renald Garvin," she said, smiling hesitantly into his hooded gaze. "How fares your lady wife?" His jaw hardened, his cold eyes flickering over her. "Well enough, I imagine," he snapped. She turned around and looked beseechingly at the man in the column beside Renald. "And you, Michael MacCleod? Has your leg been causing you any pain?" She went to the rider behind him whose face was filled with hatred and she held out her hand beseechingly, her voice choked with pleading. "Garrick Carmichael, it has been four years since your Becky drowned. I swear to you now, as I swore to you then, I did not shove her into the river. We were not quarreling -- 'twas a lie invented by Alexander to -- "
Only old Josh, the clan's armorer, pulled his ancient horse to a haft, letting the others go on ahead. Leaning down, he laid his callused palm atop her bare head. "I know you speak truly, lassie," he said, and his unceasing loyalty brought the sting of tears to her eyes as she gazed up into his soft brown ones. "Ye have a temper, there's no denyin' it, but even when ye were but a wee thing, ye kept it bridled. Garrick Carmichael and the others might o' been fooled by Alexander's angelic looks, but not ol' Josh. You'll no' see me grievin' o'er the loss o' him! The clan'll be better by far wit' young William leadin' it. Carmichael and the others -- " he added reassuringly, "they'll come about in their thinkin' o' you, once they ken yer marrying the MacPherson for their sake as well as your sire's." "Where are my stepbrothers?" Jenny asked hoarsely, changing the subject lest she burst into tears. "They're comin' home by a different route. We couldn't be sure the Wolf wouldn't try to attack us while we marched, so we split up after leavin' Cornwall." With another pat on her head, he spurred his horse forward. As if in a daze, Jenny stood stock-gill in the middle of the road, watching her clan ride off and disappear around the bend. "It grows dark," Brenna said beside her, her gentle voice filled with sympathy. "We should go back to the abbey now." The abbey. Three short hours ago, Jenny had walked away from the abbey feeling cheery and alive. Now she felt -- dead. "Go ahead without me. I -- I can't go back there. Not yet. I think I'll walk up the hill and sit for a while." "The abbess will be annoyed if we aren't back before dusk, and it's near that now," Brenna said apprehensively. It had always been thus between the two girls, with Jenny breaking a rule and Brenna terrified of bending one. Brenna was gentle, biddable, and beautiful, with blond hair, hazel eyes, and a sweet disposition that made her, in Jenny's eyes, the embodiment of womanhood at its best. She was also as meek and timid as Jenny was impulsive and courageous. Without Jenny, she'd not have had a single adventure -- nor ever gotten a scolding. Without Brenna to worry about and protect, Jenny would have had many more adventures -- and many more scoldings. As a result, the two girls were entirely devoted to each other, and tried to protect one another as much as possible from the inevitable results of each other's shortcomings. Brenna hesitated and then volunteered with only a tiny tremor in her voice, "I'll stay with you. If you remain alone, you'll forget about time and likely be pounced upon by a -- a bear in the darkness." At the moment, the prospect of being killed by a bear seemed rather inviting to Jenny, whose entire life stretched before her, shrouded in gloom and foreboding. Despite the fact that she truly wanted, needed, to stay outdoors and try to reassemble her thoughts, Jenny shook her head, knowing that if they stayed, Brenna would be drowning in fear at the thought of facing the abbess. "No, we'll go back." Ignoring Jenny's words, Brenna clasped Jenny's hand and turned to the left, toward the slope of the hill that overlooked the abbey, and for the first time it was Brenna who led and Jenny who followed. In the woods beside the road, two shadows moved stealthily, staying parallel with the girls' path up the hill. By the time they were partway up the steep incline, Jenny had already grown impatient with her own self-pity, and she made a Herculean effort to shore up her flagging spirits. 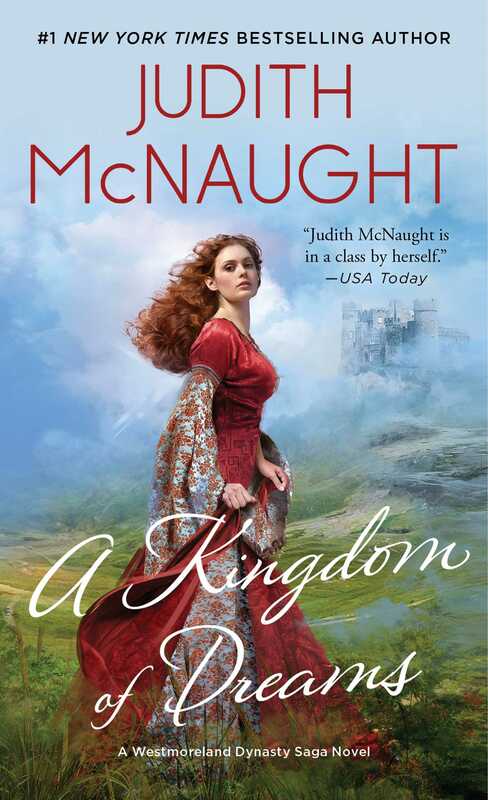 "When you think on it," she offered slowly, directing a glance at Brenna, "'tis actually a grand and noble thing I've been given the opportunity to do -- marrying the MacPherson for the sake of my people." "You're just like Joan of Arc," Brenna agreed eagerly, "leading her people to victory!" "Except that I'm marrying Edric MacPherson." "And," Brenna finished encouragingly, "suffering a worse fate than she did!" Laughter widened Jenny's eyes at this depressing remark, which her well-meaning sister delivered with such enthusiasm. Encouraged by the return of Jenny's ability to laugh, Brenna cast about for something else with which to divert and cheer her. As they neared the crest of the hill, which was blocked by thick woods, she said suddenly, "What did Father mean about your having your mother's 'look about you'?" I don't know," Jenny began, diverted by a sudden, uneasy feeling that they were being watched in the deepening dusk. Turning and walking backward, she looked toward the well and saw the villagers had all returned to the warmth of their hearths. Drawing her cloak about her, she shivered in the biting wind, and without much interest, she added, "Mother Abbess said my looks are a trifle brazen and that I must guard against the effect I will have on males when I leave the abbey." Jenny shrugged without concern. "I don't know." Turning and walking forward again, Jenny remembered the wimple and veil in her fingertips and began to put the wimple back on. "What do I look like to you?" she asked, shooting a puzzled glance at Brenna. "I haven't seen my face in two years, except when I caught a reflection of it in the water. Have I changed much?" "Oh yes," Brenna laughed. "Even Alexander wouldn't be able to call you scrawny and plain now, or say that your hair is the color of carrots." "Brenna!" Jenny interrupted, thunderstruck by her own callousness. "Are you much grieved by Alexander's death? He was your brother and -- "
"Don't talk of it any more," Brenna pleaded shakily. "I cried when Father told me, but the tears were few and I feel guilty because I didn't love him as I ought. Not then and not now. I couldn't. He was so -- mean-spirited. It's wrong to speak ill of the dead, yet I can't think of much good to say of him." Her voice trailed off, and she pulled her cloak about her in the damp wind, gazing at Jenny in mute appeal to change the subject. "Tell me how I look, then," Jenny invited quickly, giving her sister a quick, hard hug. They stopped walking, their way blocked by the dense woods that covered the rest of the slope. A slow, thoughtful smile spread across Brenna's beautiful face as she studied her stepsister, her hazel eyes roving over Jenny's expressive face, which was dominated by a pair of large eyes as clear as dark blue crystal beneath gracefully winged, auburn brows. "Well you're -- you're quite pretty!" "Good, but do you see anything unusual about me?" Jenny asked, thinking of Mother Ambrose's words as she put her wimple back on and pinned the short woolen veil in place atop it. "Anything at all which might make a male behave oddly?" "No," Brenna stated, for she saw Jenny through the eyes of a young innocent. "Nothing at all." A man would have answered very differently, for although Jennifer Merrick wasn't pretty in the conventional way, her looks were both striking and provocative. She had a generous mouth that beckoned to be kissed, eyes like liquid sapphires that shocked and invited, hair like lush, red-gold satin, and a slender, voluptuous body that was made for a man's hands. "Your eyes are blue," Brenna began helpfully, trying to describe her, and Jenny chuckled. "They were blue two years ago," she said. Brenna opened her mouth to answer, but the words became a scream that was stifled by a man's hand that clapped over her mouth as he began dragging her backward into the dense cover of the woods. Jenny ducked, instinctively expecting an attack from behind, but she was too late. Kicking and screaming against a gloved male hand, she was plucked from her feet and hauled into the woods. Brenna was tossed over the back of her captor's horse like a sack of flour, her limp limbs attesting to the fact that she'd fainted, but Jenny was not so easily subdued. As her faceless adversary dumped her over the back of his horse, she threw herself to the side, rolling free, landing in the leaves and dirt, crawling on all fours beneath his horse, then scrambling to her feet. He caught her again, and Jenny raked her nails down his face, twisting in his hold. "God's teeth!" he hissed, trying to hold onto her flailing limbs. Jenny let out a blood-chilling scream, at the same moment she kicked as hard as she could, landing a hefty blow on his shin with the sturdy, black boots which were deemed appropriate footware for novice nuns. A grunt of pain escaped the blond man as he let her go for a split second. She bolted forward and might even have gained a few yards if her booted foot hadn't caught under a thick tree root and sent her sprawling onto her face, smacking the side of her head against a rock when she landed. "Hand me the rope," the Wolf's brother said, a grim smile on his face as he glanced at his companion. Pulling his limp captive's cloak over her head, Stefan Westmoreland yanked it around her body, using it to pin her arms at her sides, then took the rope from his companion and tied it securely around Jenny's middle. Finished, he picked up his human bundle and tossed it ignominiously over his horse, her derrière pointing skyward, then he swung up into the saddle behind her. Copyright © 1989 by Eagle Syndication, Inc.